Olivia White, CEO & Creative Director of 41 Winks, Inc.
We all could use a DISCO NAP. Photo by Jen Coleman. I recently took a dance class to learn the choreography of Beyoncé’s “Grown Woman” (my all-time favorite). As expected, I left the class on cloud nine – like the grown woman I am, ready to take on the world. As I walked out of the studio, a girl who had been auditioning next door approached me and asked if I wanted one of her extra tickets to the POPSUGAR Play/Ground festival that weekend. I excitedly said “YES” and told her she just made my 2018. This was right up my alley. I took a look at the schedule and realized Arianna Huffington was speaking on the importance of Digital Detox the next day. As a fellow champion of sleep, I knew I couldn’t miss her. 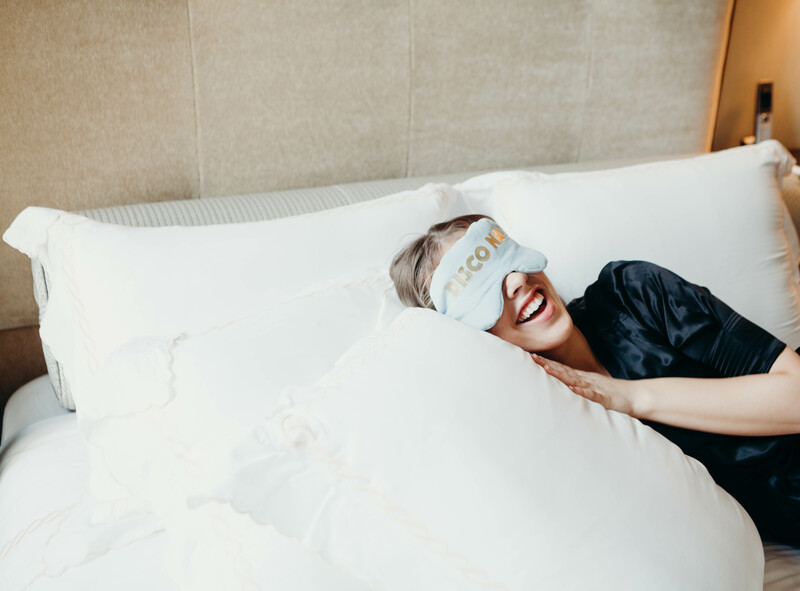 Sleep has been a huge part of my world, well… naturally, but specifically in the last couple of years since I took over as CEO and Creative Director for 41 Winks, a sleep accessories business. I love sleep. I love being cozy. I love my bed. I never dreamed I would ever be running a sleep accessories brand because that seemed too aligned, too perfect. As I get older, though, I realize I have a twisted relationship with sleeping. I tend to associate it with sleeping-in and start to stress out. What’s going on in the world that I’ve missed? What could I have accomplished all morning instead of sleeping it away? And, I have been programmed to think too much of it is bad. Am I being lazy? Successful people aren’t lazy; I need to get up. I could blame this on my family who often joked, “well, look who decided to get up today” if I came to the kitchen anytime after 9am. I could blame it on my fellow entrepreneurs practically boasting at how little sleep they got in the beginning days of building their business. Instead, though, I see no blame. Sleep is mine to have and if I need it, or want it, it is up to me to make time for it. At Play/Ground, Huffington’s talk was built around the thesis that as diligent as we are in setting times to wake up, it’s equally as advantageous to also set times for winding down at night. “Declare an artificial end to your day,” as she put it. We know the drill – put phones away, laptops and TVs turned off, maybe dim the lights, pick up some light reading, do whatever rituals help you feel calm and comforted. But I’ve found this much easier in theory than in practice, especially living in The City That Never Sleeps. When I am anxious about the next workday or am in the process of making a big decision, I have trouble falling asleep. Instead of waking up well rested, my day starts with a tight chest and pit in my stomach. On the other end of the sleep spectrum, there are times when I am so stressed I tend to sleep more – avoiding my to-dos and re-entering my dreams. It’s a vicious cycle. Sleep can get the best of me. Olivia is a proud Texan turned Brooklynite. She studied International Relations and Spanish at the University of Southern California and loves dancing, TexMex, her beagle George, and anything she considers a “New York Moment”. But most of all, she loves sleep; her bed has always been her own space to recharge and get ready to conquer the next day. When she's not sleeping you can find her surrounded by disco balls, listening to Spanish music, getting creative with her 41 Winks team.